Tucked into the trade news but reported nowhere else that I can see is a short story about mackerel negotiations on the North-East Atlantic fishery being moved to Bergen in Norway, in an attempt to resolve the long-running fisheries dispute with the EU. This is something I have reported on extensively, with the most recent piece here, but is something I probably would not have thought to report on, but for the fact that the man I was supposed to meet yesterday in Reykjavik to discuss the Icelandic fishing industry had been called away to those self-same talks. Since then we have been unable to get any news of their progress, other than they are going on all week, and so far have failed to reach a conclusion. The talks, though, did not stop me meeting with other officials at the Icelandic Fishing Vessel Owners Association, including the man mentioned in the story linked (illustrated above), the picture showing one of the fleet of huge pelagic vessels. With Björn Bjarnason, who was Minister of Justice at the time of the "pots and pans" revolution, together with former Icelandic Ambassador to Germany, Ingimundur Sigfusson, we asked the trawler owners whether they would support EU entry. Their response was unequivocal. They are against membership. It is in their interests, and in the interests of Iceland, they say, to manage their fish stocks. And that could not be done within the EU. 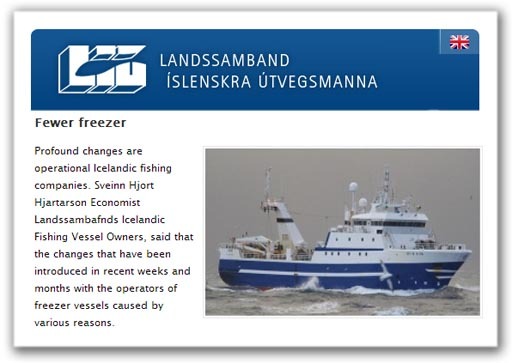 Famously, Iceland operates a system of selective fisheries closure. Their research vessels carry out real-time monitoring and, if an imbalance in the age composition is recorded, the fishery is closed within hours, with the restrictions broadcast over public radio. They could not, say the fishermen, live with a situation where fleets from different nationalities exploit their waters, requiring them to go to Brussels for a regulation to close down particular fisheries, having to argue their case in front of bureaucrats over a thousand miles away. A point made to us was that the regulation of the fisheries is science-based – there are no politics in it. Foremost advocates for control were the fishermen themselves, and they look upon the way Brussels manages the "common resource" with horror. It would be "madness" they say to hand over their fish stocks. Within the Council of the European Union (the Council of Ministers), I point out that we, the UK, have a mere 29 votes – eight percent of the 352 total - with 252 having to be cast to reach a qualified majority. Yet Iceland, with its tiny population of just over 300,000, would only be given three votes. When it comes to influence at the "top table" of the EU, therefore, there simply is no comparison between having control of their own resource, and having to compete in Brussels for the privilege of being able to catch some of their own fish. Another thing that the fishermen find totally unacceptable is the exclusive EU competence on the management of the biological resource. Iceland regards it as vital to their national interest that they keep their vote on international bodies, such as the UN FAO and the General Assembly. Overall, it was an illustration of their own power that Icelandic negotiators were at Bergen this week talking, on an equal basis, with the EU. Yet Britain, with 70 percent of the waters of the EU, is not at the talks. We have to allow our interests to be represented by the EU. And we all know where that gets us. Typically, though, the political elites still hanker after joining the EU, and they use every opportunity to promote membership. To that, we ask for an opinion – we ask everyone this – are they fools or liars? There is much discussion on this and no real answer, although the balance rests on them being fools. Others are more unequivocal. When we asked the farmers' union, there was no doubt. The elites, they say, are lying. But that is the next part of the story. I will report this when I can.